Have I said how incredible microwaves are? My friend’s mom, who used to work for Julia Child, says that real chefs don’t use microwaves. Too bad. This dessert is so good, it’s worth not being a “real chef”! You don’t have to use a kitchen torch on the top after you’ve microwaved it, but I think that it adds a nice burnt flavor. 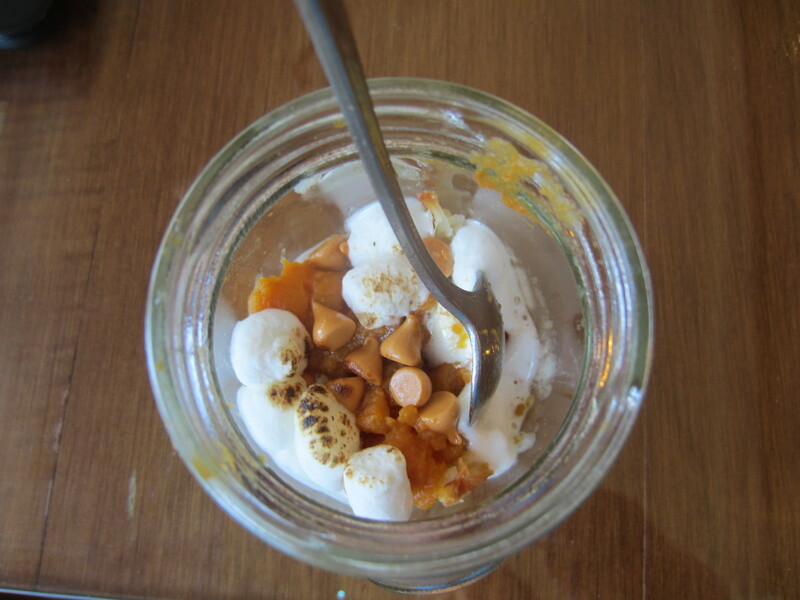 Layer 1 cookie, 1 tbsp pumpkin, a pinch of pumpkin pie spice, 1 tbsp butterscotch chips, and 1 tbsp mini marshmallows in a jar or microwave safe glass. Repeat on top of the first layer. Microwave for about a minute, but make sure to watch it the whole time to make sure that the marshmallows don’t expand too much and explode. If desired, briefly blow with kitchen torch. Then devour.